A few weeks ago I'd attended Newton Running's excellent Natural Running Clinic where Ian Adamson pointed out several flaws in my running form and provided me a couple of technique-related tips. Eager to find another running form expert able to spend individual time with me I listened with interest to an excellent presentation at last weekend's Houston Marathon Expo, as Memorial Hermann's Sports Medicine Institute's Sports Biomechanist (and M.S. in Bioengineering) Kim Gandler provided an excellent presentation regarding her basic biomechanical and gait analysis. I was impressed seeing how she uses the Institute's cutting-edge high-speed video recording equipment and computer analysis equipment, along with her deep understanding of appropriate running form and anatomy to successfully help numerous runners and athletes. Not engaging my core while running. Absent engaging my core I have an excessively upright posture without the ideal slight forward lean from the ankles that would help to improve my running form and efficiency. Having weak hip abductor and gluteal muscles, which on the free swing phase of my gait results in my hip collapse. This brings my free swinging knee too close to the other leg, and as a partial compensation I externally rotate my landing foot just prior to its strike. A rapid leg cadence (i.e. near the ideal ~180 steps per minute). A mid-foot strike, where its landing is appropriately just forward of my center of gravity. A slight knee bend at foot strike, which is protective of my tibia, knees, hip and back. Chosen well my shoes. While I have a slight over-pronation it is not excessive even in my neutral shoes, and where the over-pronation does show-up it is coming more from the forefoot (which is where the Newtons have their modest stability element). For any Houston-area runners who suspect that they may have running gait issues, are curious to identify weaknesses which may be affecting their gait, or who have had a history of running-related injuries, I highly recommend Kim Gandler's gait analysis. If you were lucky to have met her at the Expo then you may have received a special offer of $35 off their regularly priced $75 analysis, but even if not it's still a bargain! That's quite a thorough analysis! 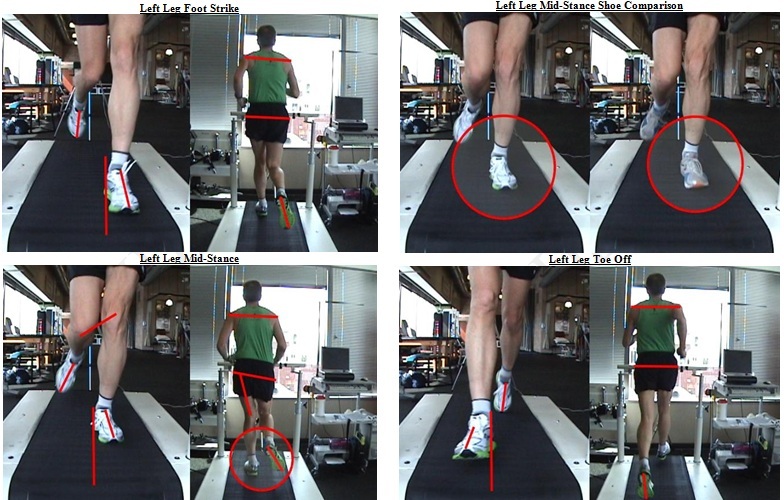 I think it's interesting how much more important gait analysis is becoming to the common runner. I waver back and forth between worrying about form and just going out... part of me feels like I could improve my performance and lessen my injury-prone nature (i.e. long-term soreness in my hamstring) but at the same time I think there's A LOT more that needs to be done, and I worry I don't have the time! Perhaps I need to pick a span of time where I run less and worry about mechanics more... might be a good idea! Whoa cowboy. Didn't you say on RRT that you regularly wear like 5 different pairs of shoes, to adjust the feel you get from the road? This is a good suggestion though. It is similar to what I did after a series of discrete injuries knocked me out for about 6 months in a 9 month stretch. But I did it with a PT knowledgeable about running. She was working on rehabbing my knee (which went out in a 1500) and made minor changes in my form to create "The New Me." With some exercises, I was able to go from I'll-never-run-5-miles-again to going a lot farther. In today's mindset, though, perhaps more drastic changes would have been employed, particularly with the footstrike. Pete talks about this. We can never know how I would have fared on the road-not-taken. But I'm skeptical that a foot-strike alteration should be the first line of defense to recurring injuries. Anecdotally, the only extended issue I've had recently, an annoying but not debilitating knee pain that has pretty well gone, arose, I think, from my trying to shorten my stride a hair. Adam - I wouldn't view improving your running form, including correcting causal muscular weakness, as costing you time away from your running. Look at it instead as enjoying the time you do spend running more while remaining injury-free. Joe - In the months since that RRT episode I've become much more consistent in my shoes, as I now only wear either my neutral light weight minimalist shoe (i.e. the Nike Free Run, or the near equivalent Saucony Kinvaras) or the Newton Stability Trainers for my long runs or races. You're a far faster runner than I'll ever be and you've got a very long running history which is relatively injury free (i.e. other than when you change your form dynamics :-), so the last thing I'd encourage you to do is to change what works. As Pete's post points out not every heel-strike is the same, and while I'd previously made a high priority of shortening my stride length and to mid-foot land instead of heel-striking I'd done so in response to a tibial stress fracture and a running form which inherently had a very hard ground impact force (which I suspect yours does not). That is really cool. I need to look for something around here like that. I think it would help me so much. But at least for now the midfoot strike seems to be working for me. I'd still like to know if I need to strengthen anything else that would help me stay injury free. It's really worth it to get a good analysis when you start running and if you become injured. I had one done during PT and I learned a lot of how I run by doing it. So cool. Man, you sure do knock your knees, eh? How do you like the Kinvaras? Wait, your cadence and midfoot strike is awesome. Nice job there Mark. The Kinvaras are great. While they're quite similar to the Nike Free Run+ which I also like, the Nike's now have 500 miles. Both shoes are neutral and light weight, and have near zero heel-to-toe drop. While it's a bit early to compare them I give the edge to the Kinvaras as they're even lower weight and have a better feel on the road.